We’re taking our own advice! Beginning today, we’ve made reporting in ByCommittee into a unified experience across both the Faculty Search and Promotion & Tenure modules. The new standard reporting interface is consistent and easy to filter, and allows you to save your settings for the future. On the “Reports” page in both ByCommittee Faculty Search and ByCommittee Promotion & Tenure, we’ve moved all of the filtering options into a new collapsible “Filter” panel that sits above the report results. All the filtering functions that were previously available in the Combined Reports feature. Basically, we made Combined Reports the default. The ability to save a specific set of report settings. The ability to filter the cases you’re seeing by unit, template, status, or date, all from a single window rather than totally separate tabs. A “Columns” menu to replace the former “Criteria” list. These are the 17 possible data types that you can choose to include, in any combination, about each case in the report. Across both modules, we heard that our administrative users were spending more time than they wished in filtering down to the right parameters each time they wanted to see a certain combination of data. In addition, that manual process of re-assembling a report (which you might run only 2-3 times a year, or less) leaves room for inconsistency over time. So it seemed very worthwhile to invest in a way to save your settings. In addition, since data reporting is a major benefit that many of our institutional clients mention, we wanted to make the reporting interface as easy as possible to learn (and to teach). So the first step was making the controls as similar as possible between different types of reports and between the two modules. Mostly, it’s just easier on the eyes, more conveniently arranged. But it should enable you to report on your school’s faculty hiring and promotion patterns in greater depth, more consistently, and more efficiently. With the ability to save searches in both Faculty Search and Promotion & Tenure, you can start to compile consistent data over a longer period of time, and be confident that you’re comparing apples to apples. 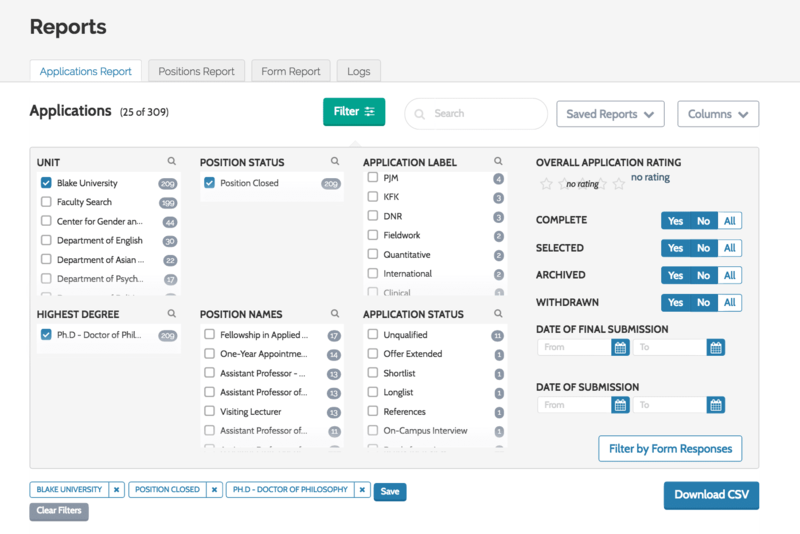 Because the “Filter” panel is starting to show up in more and more places, it should make reporting a little easier to teach to new administrative users at your institution. Have questions, reactions, or suggestions? Feel free to contact us at clientsuccess@interfolio.com!